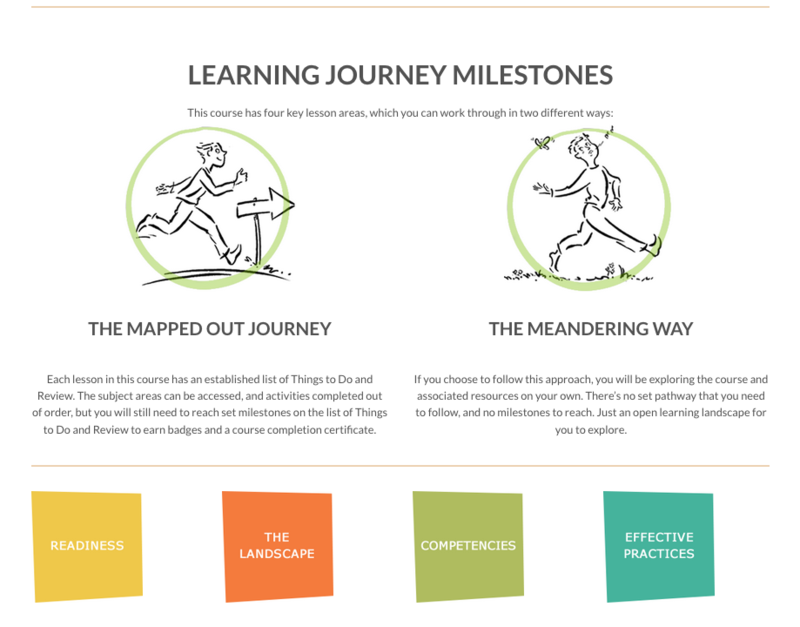 Quality online course design is essential to virtual success. 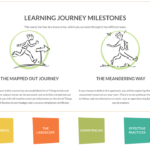 But in creating these courses, educators often find themselves attempting to mimic or retrofit the face-to-face classroom rather than optimizing the power of digital technology in the service of active, authentic and accessible learning. That’s why multi-institutional teams of instructional designers and librarians, distance learning experts and technologists at Open SUNY have developed a uniquely flexible, open source course design rubric called OSCQR, which can be used and adapted by any institution at little to no cost. 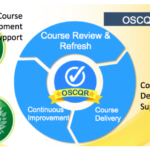 Grounded in evidence-based practices and quality standards for online teaching and learning, the Open SUNY OSCQR Rubric and Process support a customized, scalable and systematic approach for continuously improving instructional course design quality and accessibility. On top of that it offers a system-wide method for collecting data across campuses, departments and programs, which can be used to inform faculty development. 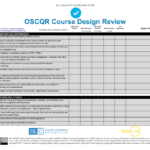 The OSCQR Rubric incorporates online course design standards and accessibility standards that can be applied by instructors, designers and technologists across a variety of quality assurance activities. 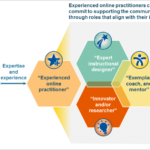 Likewise, it can be used formatively to help guide new online faculty in designing their courses as well as summatively to continuously improve existing courses. 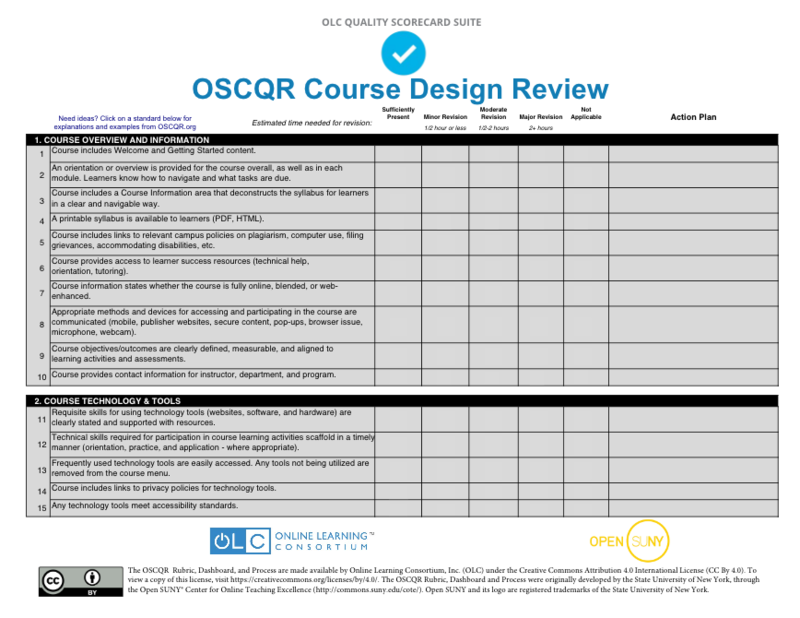 Using this rubric as its foundation, the OSCQR Process begins with a framework that includes a course review, which automatically generates a quality improvement action plan…a course refresh based on those design elements targeted for enhancement and a learning review that identifies and prioritizes next steps for continuous progress. The Process also provides an automated Dashboard tool from which all rubrics at a given campus can be generated, customized and managed, using built-in analytics to aggregate and track data around quality improvement goals and suggest areas for faculty training. OSCQR is getting rave reviews from students and faculty alike, who are experiencing high levels of satisfaction and reported learning. It is also winning national recognition, including the Effective Practice Award from the Online Learning Consortium and the Distance Education Innovation Award from the National University Technology Network. Among many outstanding innovative approaches in online learning, Open SUNY rises to the top in driving faculty and student satisfaction. 530 certificates and online degree programs from 44 campuses (75% are fully online). 68 online programs from 20 SUNY institutions carry the Open SUNY+ designation. In this showcase we will look at three award-winning programs including their course design rubric, digital badging ecosystem and their “Interested in Teaching Online” course. These are of particular interest because they are openly licensed for all to use! Open SUNY has developed an online course design rubric and process that addresses both the instructional design and accessibility of an online course. In the spirit of collaboration, it is openly licensed for anyone to use and adapt. 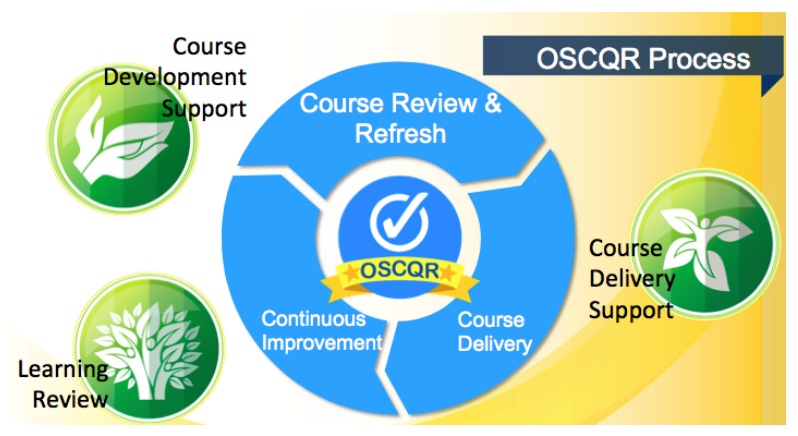 The Open SUNY Course Quality Review (OSCQR) Rubric and Process supports continuous improvements to the quality and accessibility of online courses. It also provides a system-wide approach to collect data across campuses, institutions, departments, and programs that can be used to inform online faculty development, and support large-scale online course design review and refresh efforts systematically and consistently. 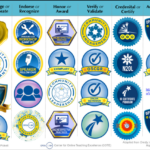 A partnership with the Online Learning Consortium (OLC) initiated in November of 2016 has resulted in the adoption of OSCQR as one of the association’s online quality scorecards. OSCQR is currently being used by 56 SUNY institutions and 825+ non-SUNY national and international individuals, institutions, and organizations. Open SUNY formally recognizes the diversity of roles and expertise among thousands of their online practitioners across the SUNY system with a digital badging ecosystem and Open SUNY Fellow Program. 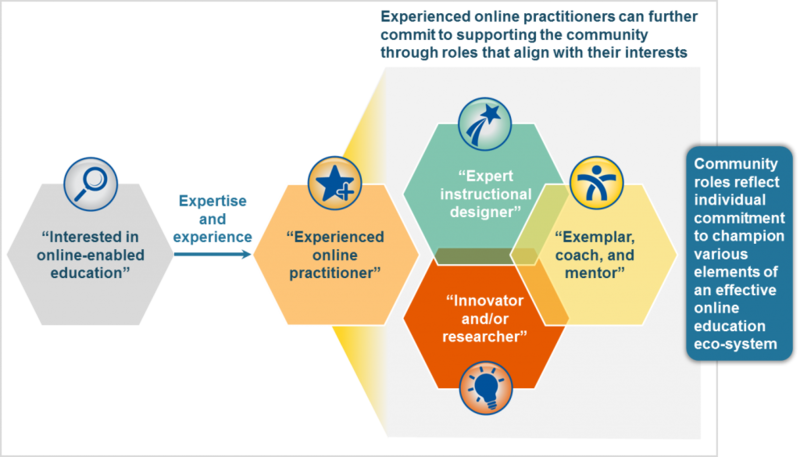 The Fellow Program is instrumental in building a community of practice targeting a wide spectrum of online practitioners instructors and designers. 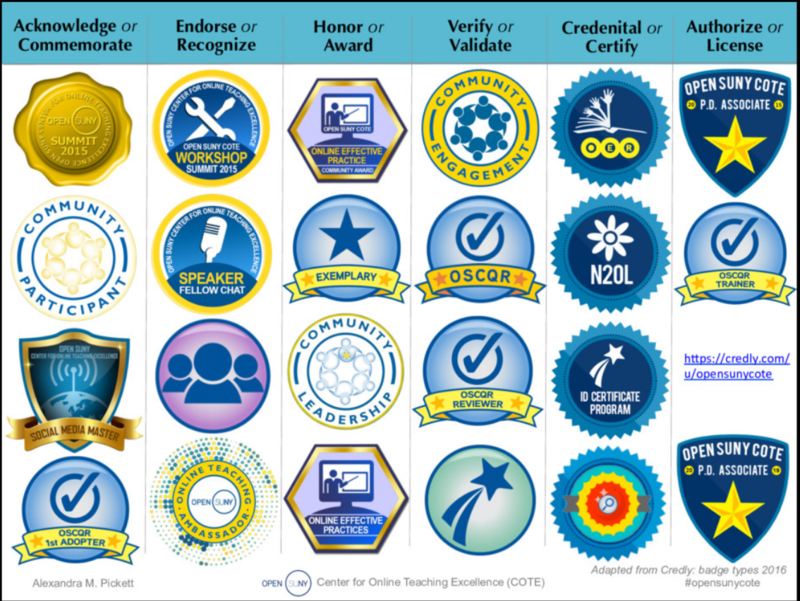 The comprehensive digital badging ecosystem is made up of stacked constellations of badges as a way for Open SUNY to recognize, honor, and track online community membership, engagement, and contributions. 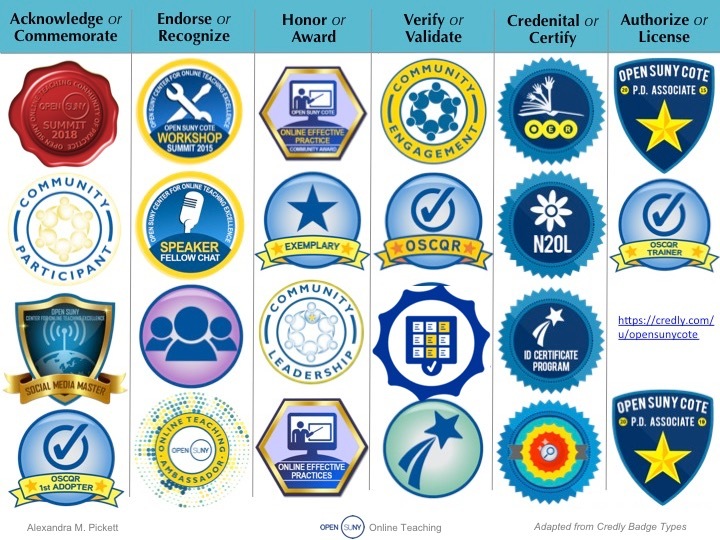 Through this creative and innovative way to recognize competency and reward effort, the digital badge credentials provide metadata that link back to evidence of contribution, achievement, skill development, performance, or behavior. 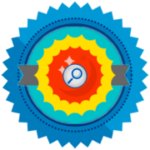 As digital badges make accomplishments more visible and are becoming a professionally valued currency, many are sharing their badges on online profiles. To date over 2,300 badges are being proudly displayed through social media with 88% shared in LinkedIn, 9% in Facebook and 3% on Twitter. More anecdotal evidence in how online practitioners are using their badged honors and recognitions in promotion/tenure processes, an be found in résumés, bios, signatures, and online profiles, and at the institutional level in press releases for institutional recognition. 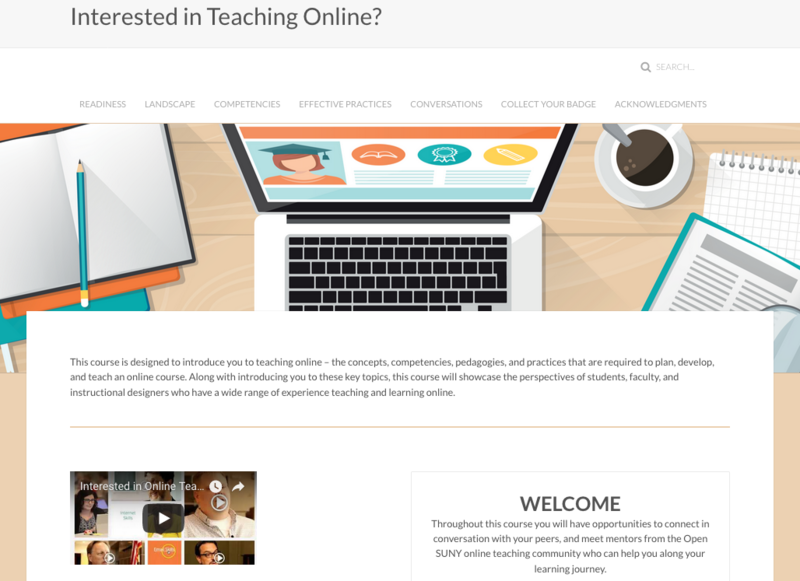 For those interested in learning more about teaching online, this team also developed a free self-paced openly-licensed resource. 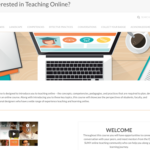 The aim is to provide an entry point for anyone interested in online teaching. It lowers barriers and provides a way to address online faculty readiness, self-assess the necessary fundamental technical skills, and dispel misperceptions. 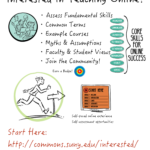 It provides online faculty, staff, and student perspectives on effective online teaching. 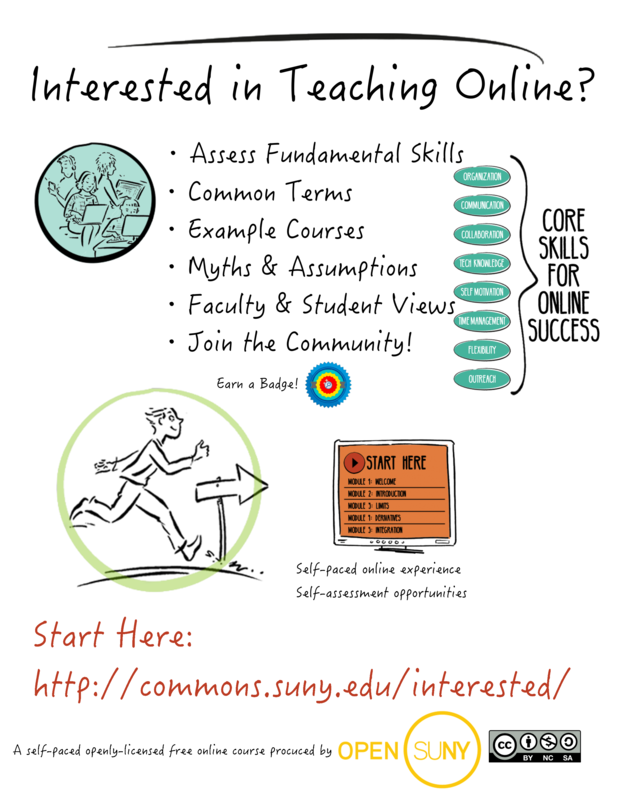 The Open SUNY Interested in Teaching Online? 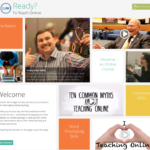 resource and the companion Online Faculty Readiness resource are effectively being used across SUNY. They are also being explored and considered in how they might be adopted/used in a variety of ways by universities worldwide. 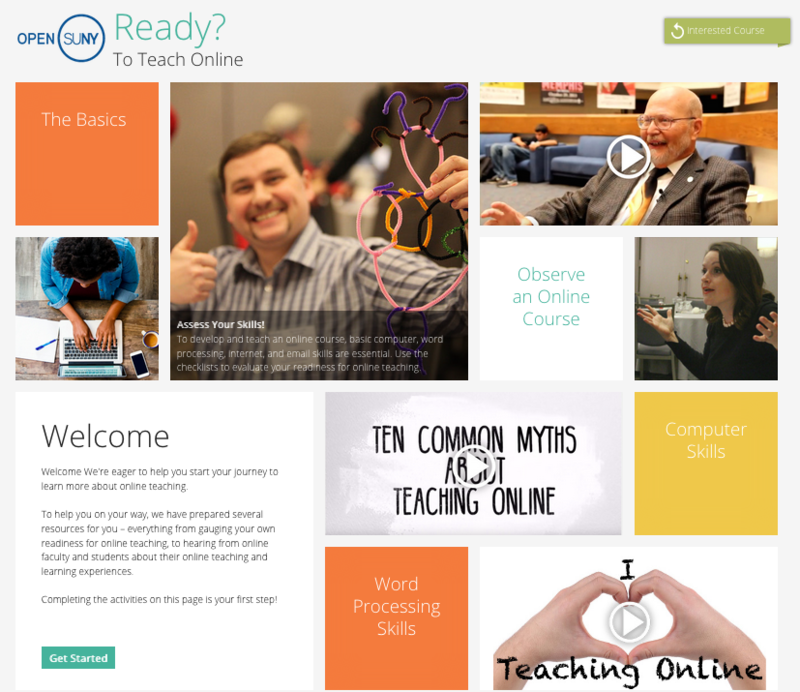 For Open SUNY, the unique self-paced online resource allows them to consistently and systematically provide professional development on a large scale. This mechanism prepares cohorts of potential and interested faculty with a fundamental understanding and set of skills to be successful online. 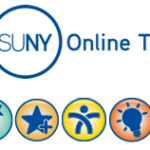 Since its launch on October 2017, Open SUNY has had 9800+ users engage with the resource from 123 locations nationwide, and 43 foreign countries including Finland, Belgium, Chile, Lebanon, Japan, Switzerland, South Africa, Mexico, Malta, Indonesia, and Germany. With excellent resources and systematic design, Open SUNY is cultivating a community of practice for online practitioners with an impressive way of developing, rewarding and incentivizing to achieve great success. Their outstanding innovative approach is not only producing evidence-based best practices and quality standards, but is ultimately achieving high levels of satisfaction for faulty and students. What a generous contribution as Open SUNY shares these tools and resources with the greater community worldwide to ultimately expand the amount of online practitioners while establishing quality and ensuring satisfaction.